1 ден: Arrival in Sydney. Accomodation in a hotel 3 or 4 stars. Free time. Tourism in Australia is a statutory authority of the Australian Government, which promotes Australia as a tourism destination internationally and domestically and delivers research and forecasts for the sector. Australia is unique. It is the only country that is also a continent. Australia is the sixth largest country and the smallest continent in the world. Australia is sometimes referred to as being "down under", because it lies completely within the southern hemisphere, but the official name is the Commonwealth of Australia. There are many different kinds of environment in Australia. Climates that range from tropical in the north and cool to the south. The interior is mostly desert or dry grassland with only a few settlements. Only Antarctica gets less rain or precipitation than Australia. Ayers Rock sits in the heart of Australia and it rises 348 meters from the ground. That is only a third of it; the reminder is under the ground. It poses many questions to seekers and it is a mystery. How was this solitary rock formed? The Aboriginal people have their own answers and legends that they will share with you. Not too far away there is Kata Tjuta, or The Olgas, meaning many heads. It is a collection of 36 stunningly red stone shaped monoliths. Another neat geological site to visit is the Bungle Bungles. It is a collection of beehive style formations standing in alternating bands of black, green and orange. These are very ancient formations but were kept secret by the locals. The rest of the world did not know they existed until the 1980s. The Pinnacles are another geological formation and a haunting landscape. They are found in the Red Desert. 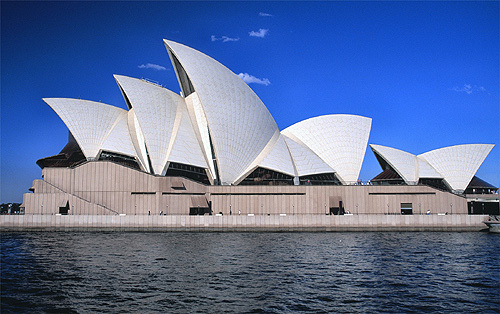 You can't go to Australia without visiting the world famous Sydney Opera House. It is one of the world premier performing arts center. It was opened in 1973 and it has taken its place among the world's most important buildings. It took fifteen years to build. It is also the one of the architectural wonders of the world. The Great Barrier Reef has more than 1000 islands, 2900 individual reefs and shelters 1500 species of fish and 400 species of coral. It is a little something for everybody. Many of the islands there are undisturbed. It has incomparable and breathtaking natural beauty. Another must stop place is Kangaroo Island. It is located near the tip of South Australia's Fleurieu Peninsula and is Australia's third largest island. There are kangaroos, dolphins, koalas and sea lions that live there in harmony. This place has been preserved from excessive tourism and overdevelopment and many of the original flora remain there. The attraction here is that it is isolated from the mainland. You get to see nature untouched. If you were to plan a trip to Australia, you should be there long enough to see the entire natural and man made beauty it has to offer!! 2 day: Breakfast. Tour of Sydney: The port, Harbour bridge, The Opera, the casino Star Sity, Kings Kros, Bonday beach, Padigtoun. 3 day: Breakfast. Cruise in Sydney harbur with lunch on board. Return in Darling port. 4 day: Breakfast. Flight back. Prices depend on the starting point of the travel and on the type of the accomodation.